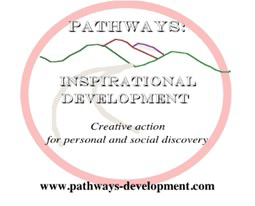 Pathways Inspirational Development (UK) is a Community Interest Company composed of a network of supporters and experts who draw together to develop innovative, creative experiential learning opportunities. It primarily works to provide education and training based on the concept of ‘journey’ with learner centred active, experiential and problem-solving based approaches. Pathways has developed innovative provi-sion for social and cultural value in the UK & through engaging in international exchanges with adult groups across Europe which develop reflec-tion, understanding & deep learning. Pathways journeys encourage participants to explore & analyse their social & cultural context. These journeys have included creating labyrinths inside buildings, short & long distance walks, with many taking place over several days or weeks & journeys associated with international partner-ships in which participants from several countries may share. ‘The Journey’ is both a physical event & an experiential educational tool, it becomes a ‘temporary travelling communities’ and is a method that assists personal and social development. All of Pathways’ activities remain closely attached to the core element of ‘journey’. The physical has always been viewed as a means to approach a range of personal, social and cultural issues. In being concerned at its core with ‘experiential learning’ Pathways remains focused on innovative and enterprising approaches to problem solving. Thus any physical journey encourages participants to explore their social & cultural context & reflect personally on the experience & develop learning through an active process.